Reprinted with permission from The ShinDao Dynasty. 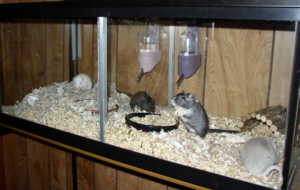 ( At some point in time when owning gerbils, several situations come up that require a little bit more intervention when getting two of them together. 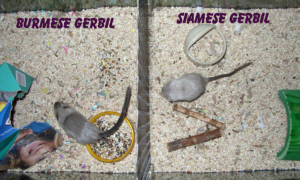 MALE gerbils are certainly the EASIEST to get together with pups smaller than 8 weeks of age, and easier to have a "Clan" of 1, 2, 3, 4, or even 6 gerbils together. However, having a clan size of more than two, and even two-somes at times, can have problems later as they grow up and a clan that lived together peacefully for 3 or 4 months.. can suddenly start at each-other's throats fighting and drawing blood on each other. THIS is known as "DE-CLANNING". It can be caused by almost anything..such as a strange smell on your hands when you forgot to wash them, to dominace issues, to they just suddenly decide they don't like eachother any more. 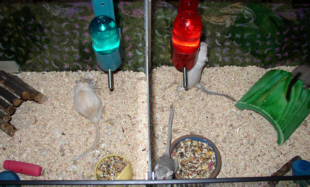 FEMALES are another matter completely and the truth is, with females.. unless they have been together as pups and always known eachother ( usually siblings ) then no matter WHAT the age of the gerbil you try to introduce to a female.. your're going to HAVE to use the Split Cage Method in order to get them together. No IFs, ANDs, or BUTS, about it. Otherwise.. your going to end up with with either one of them or both of them injured or possibly dead. 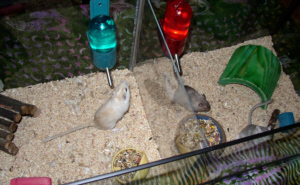 There HAVE been some cases of females or males getting together without any problems or any Split caging that were older than 8 weeks.. but these are such RARE occurances that if you try it without Split caging.. your more than likely going to have a fight, some blood, and if you don't do anything.. possibly a Dead gerbil. Either that or something out of a WWE Main Event! In either case, it sometimes can’t be helped that something happens where this kind of “introduction” method has to be used. Heres a list of the types of introductions you would need to Split Cage for. In regards to that last listed introduction, a lot of times with an adult male and a 5 to 8 week old pup, usually you can place both of them in “neutral” territory. OBSERVE them for a while.. and usually, there won’t be any fight outbreaks. But.. if a fight DOES break out… Well… let’s get to the explanation on how to do this, eh? The latter, Fish Divider, I wouldn’t recommend if you are looking to permanently split cage an aquarium, like a 20L. Its fine and works well for temporary split caging, but I doubt it will hold up to anything longer as it is rather thin and flimsy. At the time, our shoyusha used one of these fish dividers to split our brother, Kai’yu and his new mate, pretty little Katsegura. She had to reinforce the edges with Masking tape and it lasted no problem for a week and ½. If the Split Cage had to last for a few months, I don’t think it would be up to the task. The brackets that come with the Fish Divider package however, work excellent. They have metal clips that hold them snug against the sides of the tank and they could even be glued to the glass for permanency if you needed to. You may need to file them down to fit, because they come rather on the LONG side. The only problem I say with those fish brackets is well.. they are plastic.. and you know US, we're happy to chew them for you! 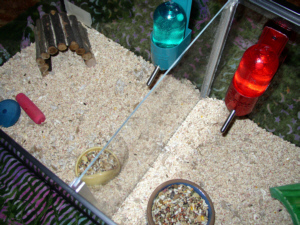 Once you get this all set up, the divider snug within the Aquarium, you need to set up both sides with bedding, water bottle, food dish, something to sleep in, and some wooden chewies. Then place ONE gerbil on each side. 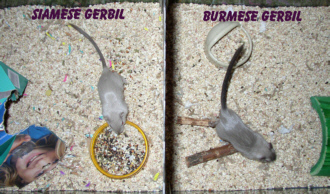 Then, about once a day or even twice a day, pick both gerbils up and swap them to different sides. You’ll need to do this for at LEAST 7 days. Sometimes up to 10. 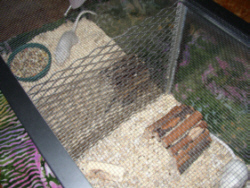 This way, with both gerbils in each other’s territory, will get used to how the other gerbil smells. With each passing day, scents become familiar and they no longer consider themselves strangers. NOTE: You CANNOT use this method to introduce a lone adult gerbil to an already established adult GROUP. This will not work. The loner will be considered an outsider to the clan and the established group WILL gang upon the other and possibly kill him/her. 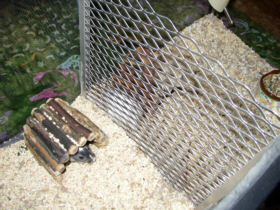 One GOOD clue on how to tell if your gerbils are ready to stop being alone and get together with each other is they will start sleeping by the divider and near the same corner, so they can feel each other’s fur through the divider. Once the 7 or 10 days are up, then you will want to introduce them in “neutral” territory and keep a CLOSE EYE on them for about 30 minutes to an Hour. If no fights break out, then you will need to clean their tank out and place them within it. If you are using their tank as the split cage, then be sure to remove the divider. One thing that really helps when your ready to place them in the home they will be sharing, is to take about a ¼ capful of Vanilla extract and mix it with about 2 capfuls of water. Dab a drop on their nose.. and then dab a couple of drops down their backsides. This helps as the vanilla overpowers their own scent and makes both of them smell the same. You’ll need to separate them as soon as possible and you could certainly get bitten in the process. But if you don’t separate them.. you’re going to end up with either a severely injured gerbil.. or a dead one. You will need to try the Split Cage Method all over again.. and possibly for a bit longer. Unfortunately.. once blood has been drawn.. usually it is un-reconcilable and they won’t ever get along. Sometimes they can.. but it is a rather rare occurance. When they have been placed in the same tank, KEEP your eyes on them for a few hours to make sure they don’t decide to turn on each other. After about 3 or 4 hours, if nothing remarkable has happened, then it’s usually a sign of a successful Split Cage. Behaviors like chasing, exploring, boxing, and squeaking at each other doesn’t necessarily mean they are about to attack each other. Just keep an eye on them. Signs like bite marks near the tail or on the rump is a sure sign that trouble is brewing! by using aluminum channel, rubber bumpers, aquarium silicone, and expanded steel for the divider. The dividers are REMOVEABLE and the expanded steel can be replaced with PLEXIGLASS to create 2 10 gallon tanks out of a 20 gallon tank for gerbils you don't want to introduce but have limited space unable to support 2 10 gallon tanks. 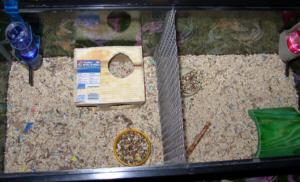 Until lately, the only way known to make a Split Cage was by using Hard-ware Cloth found at hardware stores ( about 18 gauge ) and cut with tin-snips to slide snuggly ( diagonal ) into a 20 gallon or 10 gallon tank from corner to corner, making two TRIANGLES out of the tank. 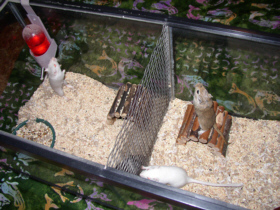 Also, the Hard-ware Cloth had to be tall enough to fit aganist the Lid of the tank when the lid was placed on top of the tank to make sure that the gerbils to be introduced could not climb over to the gebil on the other side while they were being Split caged. Our Shoyusha did NOT find this attractive at ALL and went about looking for a way to make split a tank in a more attractive and much more secure means. Lanie, of Royal Star Gerbils -- for supplying a email she got to start the "idea" process. Twin Squeak's Kennel in Nebraska -- for sending the email to Lanie with the original Split-Cage idea that our Shoyusha and her father modified. Shoyusha's FATHER -- for helping to come up with various ideas and help in the tedious process of creating the Split Cage. Also, helping our shoyusha build the very 1ST split tank for the Dynasty. And of course, Shoyusha's Mate (hubby) -- for being willing to help in the tedious process of cutting the aluminum channel. Below will be some pictures of how these Center Split-Tanks look and some of the Dynasty who reside in them. PLEASE NOTE:: You CANNOT buy these Tanks split like this in STORES. If you like what you see, then contact our Shoyusha by email and she will be happy to help in making one for you for a modest price. However, she will require you to BUY the 20 Gallon Tank that YOU want Split.